Folk performances run all year round and are a great form of evening entertainment. We are comparing Hungarian Folk Performance Prices from leading ticket suppliers and Try to find you Cheap tickets prices on the market. The Danube Folk Ensemble was originally founded in 1957 and is widely regarded as the best folk group in the country. The ensemble bases their performance on authentic dances that date back hunderds of years. The Danube Palace dates back to the 1890’s and is one of Budapest’s grandest buildings and boast beautiful neo-Baroque architecture. The palace has been considered a culture hub for decades. Your Experience With Hungarian Folk Performance? Admire the colourful costumes, talented footwork and impressive singing. Head to the bar during the interval for a refreshment before returning to your seat to enjoy the second half of the show! What Hungarian Folk Performance Includes? Performances on the weekend sell out fast, make sure you book in advance to secure your date. 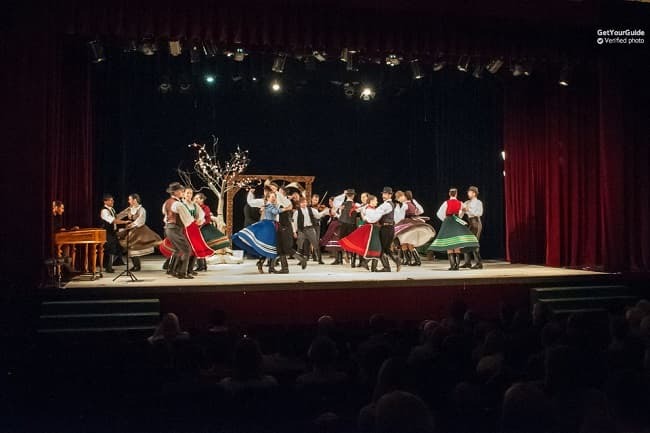 Travelers Reviews about Hungarian Folk Performance? Tickets booked through Get Your Guide and Tiqets can be cancelled for a full refund 24 hours in advance. Tickets booked through Viator can be cancelled for a full refund 7 days in advance. Please arrive 30 minutes before the show begins. Hotel pickup and drop-off is an optional extra. Danube Palace, Zrinyi u. 5, 1051, Budapest.